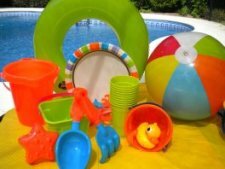 Pool Party Themes - Don't Just Have a Pool Party. Give It A Theme. 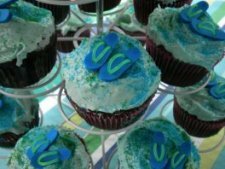 Don't just have a pool party, give your party a theme. You will be amazed by how much easier it is to plan the invites, the decorations, the pool party games and the party favors. 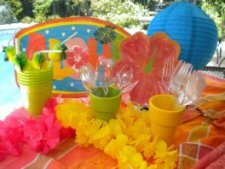 Just to give you an idea of how deciding on a theme gives direction to the whole event, our granddaughter helped plan her summer birthday pool party. She loves butterflies but also likes to have boys at her party. 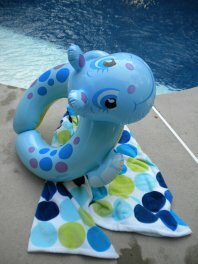 So she decided on a Bullfrogs and Butterflies pool party theme. 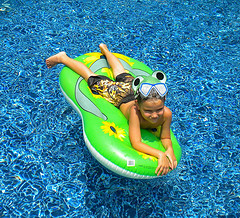 Dive eggs have plastic frogs or butterflies and frog beach balls decorate the pool. 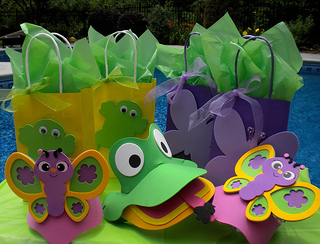 Frog and butterfly foam visors are provided for each guest for the pool party parade and as take home favors.